Yuka, a second-year high school student, spends most of the money she makes from her part-time job on fashion. She wants to look her best, even when she's at home, and always wears makeup. Sachi, a second-year student, wants to wear clothes that suit her well. She wants to try wearing makeup, too, but spends most of her money eating out and chatting with friends, leaving her with little money to buy cosmetics. Kaede, a third-year student, has recently been doing a lot of inexpensive shopping on the Internet. She's not concerned much with trends. Hanako, a third-year, knows generally what she likes to wear, but hasn't yet found the kind of style that she thinks looks best on her. 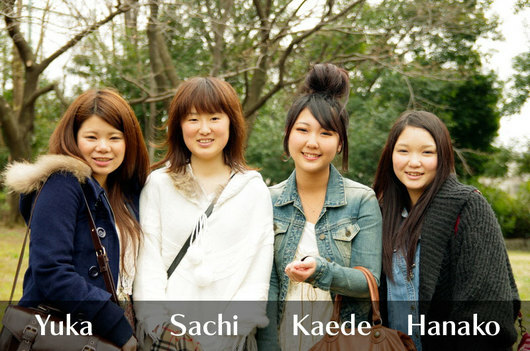 These four high school girls in Tokyo are all deeply interested in fashion. We asked them how much they spend on clothes per month, and about their views on fashion. Q: Where, and with whom, do you go clothes shopping? Sachi: I go with friends to places like Harajuku and Ikebukuro. My mom doesn't like shopping, so she never comes with me. Yuka: I either go alone, or with another friend. I never go in groups of three or more, because I don't want to drag friends around to the stores I want to spend time in. But it's good when you're with another friend, because it gives you a chance to try new clothes. I go to places like Shibuya, Ikebukuro, and shopping malls like Aeon. Hanako: I probably go shopping most with my mom. I go with friends, too, but my mom knows me best, and gives me lots of advice. Kaede: I've recently been doing a lot of shopping on the Internet, from places like Grail, Galstar, Kobe Lettuce, and LuzLlena. It's cheap. Q: How much money do you spend on clothes per month? Does that money come from an allowance? Yuka: When I was in junior high, I would buy a little bit here and there each month, but since I've been in high school, I spend about 40,000 or 50,000 yen at once every two or three months. The money comes from what I make at my job. I work about three times a week at a donut shop, and the pay comes out to about 40,000 yen per month. That money not only pays for my clothes, but also food when I'm out, and cosmetics. Makeup eats up a lot of money. For example, fake eyelashes cost me about 5,000 yen per month. Sachi: I work, too. But I spend most of the money I make on going out with friends and getting fast food with friends after school, than on clothes. I make about 20,000 yen per month. I also get 10,000 yen in allowance from my mom. Hanako: I don't really buy too many clothes. I'll buy one item, and mix and match it with other clothes I have. I work at a pizza place, sometimes up to five times a week, and make about 40,000 to 50,000 yen a month. I spend it on my cell phone plan or to go out, than on clothes. Kaede: Sometimes I spend 10,000 yen on clothes in a month, and sometimes I don't. I also pay for all my clothes, cell phone service, and food--when I go out--with the money I make from my part-time job. Q: What are you most careful about with when you're dressing up? 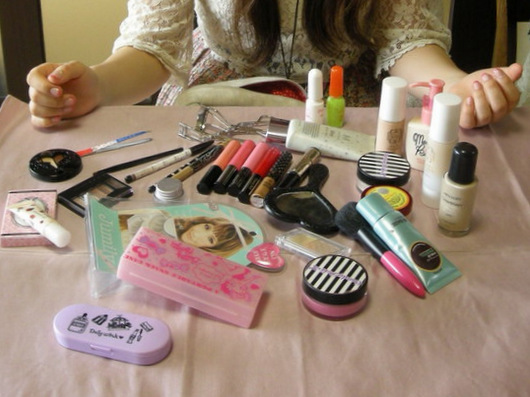 Yuka: Makeup. I also adjust the length of my skirts and try to wear high heels to make my legs look long. Kaede: I try to wear things that suit me, and make sure that things like my hair and the colors I'm wearing are in balance. Trying to make my figure look good is really important. Yuka: I love fashion. When I'm wearing clothes that I like, it boosts my mood. If I'm walking down the street and see someone who's unkempt, I think, I don't want people to see me that way. Even when I'm at home, I want to wear what I want and be surrounded by the things I like. The same goes for furniture, too. It makes you feel a lot better, and it's fun. I'm happiest when I'm thinking about what color I should dye my hair, because I can forget about everything else. Sachi: I like fashion, but I'm not as interested in it as Yuka is. But it still makes me happy when someone compliments my clothes. Hanako: The way you feel when you're wearing your favorite clothes is very different from when you're not. It makes me happy, too, to be complimented on my clothes. The reason for dressing up is because we want to boost our spirits and look as cute as possible. When I see someone who doesn't care about their appearance, it makes me want to work on myself more. And I want to work not just on my looks, but on what's on the inside, too. I want to be someone who's not stingy, who's nice to everyone, who's an all-around attractive girl. Kaede: I don't dress up for a reason. Girls can wear skirts, and we can wear makeup, and put our hair up and do other things with it. And since we can, I think, why not? I have a bit of a foul mouth, so the least I can do is look good. Q: Who do you think is fashionable? What kind of person do you want to become? Yuka: I want to be someone who's fashionable even at home, has a sense of who she is, and is kind to those around her. I really admire the stylist Kazama Yumie. Sachi: I think being fashionable means wearing clothes that let you have fun and feel confident. Hanako: Someone who's balanced. Someone who looks like they're having a good time. Kaede: I want to become like my mom. She got divorced when I was three, and raised my older sister and me on her own. I'm sure she had to make a lot of sacrifices and worked really hard. I think that being fashionable includes all those things. I want to be a fashionable, feminine person even as I age. Q: Do you wear a uniform to school? If not, what do you wear? Yuka: At my school, we don't have to wear a uniform on a daily basis, but we have hyojunfuku (standard clothing), which is a uniform that we're supposed to wear on special occasions. I also own a nanchatte seifuku (outfits based on girls' school uniforms), but since the ribbon on our hyojunfuku is cuter, I wear that to school. Some students wear either hyojunfuku or a nanchatte seifuku depending on how they feel, and some students just wear their regular clothes. Sachi: My school doesn't even have hyojunfuku. We're allowed to wear what we want, but since it's a pain to have to think about what to wear every day, I wear a nanchatte seifuku to school. More and more students in their third year start wearing their regular clothes. I don't know why, though. Yuka: I wouldn't want to go to school every day in my regular clothes, either. I have to leave my clothes for the times I see my friends outside of school. You wouldn't want your friends to think you're wearing the same clothes over and over again, right (laughs)? Kaede: My school has a uniform. We can wear makeup, but we're not allowed to wear our regular clothes. I like my uniform. I basically chose my school because of it. I like the summer skirt better, so even in the winter, I wear the summer one. Hanako: I like my school uniform, too. Yuka: Uniforms are an important factor when deciding on what high school to go to. I could never go to a high school whose uniform I didn't like. Sachi: The school I wanted to go to didn't have a uniform, so I was torn at first. But when I went on the school tour, I was relieved to find that a lot of the students were wearing nanchatte seifuku. It would've been too much trouble to think about what to wear to school every day. Q: What do you like about uniforms? Why? Yuka: It would be too exhausting to have to wear regular clothes to school. Uniforms cover up your legs, so you don't have to worry about how your legs look. Sachi: If you had to wear regular clothes to school, you'd have to come up with outfit combinations. There's no time in the mornings to do that! Yuka: It would be a drag to have to think about that every morning. With makeup to put on, there's no time. Sachi: Uniforms make life easy, hands down! Yuka: I also think the great thing about uniforms is that they look good on everyone. Sachi: I know. When people wear uniforms, they all look so cool. Yuka: If you tinker with the length of your skirt or your navy socks, you can make your legs look longer. It's incredible that everyone's done their research, and has figured out what length works best for them. Q: Do you wear makeup to school? Do you dye your hair? Sachi: I don't wear makeup. I want to and I always think I'll buy some when I get paid at work, but then I end up going out to eat with friends...As for my hair, I dye it myself. Yuka: You do this yourself? You're really good at it. Hanako: We're not allowed to dye our hair at my school. If they find out that you have, they make you go home and dye it black before they let you back to school. 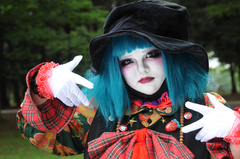 Yuka: We're allowed to dye our hair and wear makeup at my school. Of course, I wear makeup to school, but I try not to put on too much when I'm wearing my uniform. Kaede: I wear a lot more makeup when I'm in my regular clothes, too. Yuka: Especially when it comes to eye makeup. Eyes are the most important when it comes to makeup! I can't live without my fake lashes, color contacts, mascara and eye shadow! 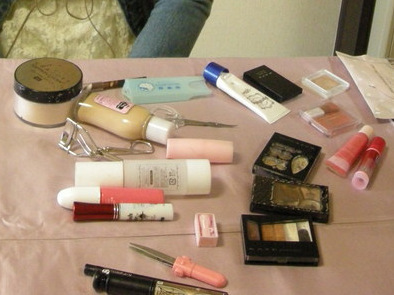 The makeup Yuka carries around with her doesn't fit in a standard toiletries bag. Kaede says she probably has less than the average girl when it comes to makeup.